LW Propagation - The time of the year and hour of the day are important to successful DXing on LW. Although in theory LF and VLF propagation is generally considered to be mainly ground wave, most NDBs are actually in the medium wave band (MW) which is 300 kHz up to 3000 kHz. MW does have both ground wave and substantial sky wave propagation characteristics. About the only NDB DX reception is going to happen at night and up to just before local sunrise. Below 100 kHz, ground wave makes up the majority of the signal propagation, however losses due to absorption are highest during the daytime so best signals are usually a nighttime occurrence. Sometimes sky wave will still happen in the LF part of the spectrum and this also adds to nighttime's advantage for better reception. Although you can receive the Navy MSK VLF stations (19kc to 25kc) day or night, weaker LF stations, like JJY at 40 kHz, can only be received just before local sunrise and still nighttime west across the Pacific to Japan. Due to the sun's position, its affect on the ionosphere and the intense noise generated by the sun's activity, winter nights are always best for reception on LF and MW (in the Northern Hemisphere.) Summer is plagued with countless thunderstorms that add intense noise to the LW spectrum - day and night. Usually by mid-September, the LW signals are getting better and the summer noise is becoming less bothersome. By mid-May, the noise is again increasing to the point where only the strongest signals can be heard. Therefore the LW listening "season" is usually considered to be between the Autumnal equinox and the Vernal equinox. Also, low noise LW conditions generally occur during sunspot minimum during the 11 year sunspot cycle. Increased solar activity, usually favored for HF DX, increases the band noise on LW. VLF is not usually affected by much of anything which is why it is used for 24 hour, worldwide USN communications. The US Navy MSK stations located around the world are always easy to receive with equipment that can tune low enough - 19kc up to 25kc. Tuning around below 500kc offers some interesting challenges and a different kind of DXing. Nearly all signals encountered are either CW, MCW, RTTY or some kind of data transmission. There are virtually no voice transmissions except for a handful of foreign longwave BC stations. Here are some of the types of signals found below 500kc. Canadian NDBs will follow their station call with a "key-down" signal until the call is sent again. This makes all Canadian NBDs easy to identify. Also, most Canadian NDBs run substantially more power than the typical 25W US NDB, so their NDBs usually put out strong signals. Sometimes Mexican NDBs will proceed the ID with a "long dash" - not "key down," just a long dash, (I have heard this on GRN several times but not on other Mexican NDBs.) NDBs can be found from 190kc up to 529kc. Many NDBs are being "covered up" by powerful DGPS* signals within the same part of the spectrum (generally signals from 285kc up to 325kc are predominately DGPS signals in the Western USA.) Since the NDB signals are MCW, a carrier is always present on the assigned frequency. With the receiver BFO on, it is easy to locate the NDB carrier and then ID the station when the call is sent. Nearly always, there are multiple NDBs assigned to the same frequency so listening for different characteristics of the transmitted signal becomes part of the method of identification. Also, due to changing propagation, different DX NDBs assigned to the same frequency, will be heard during different listening sessions. Once the NBD call letters are known, they can be checked against one of the NAV-AID websites. By entering the station ID, the websites will provide the NDB airport location, assigned frequency and sometimes the transmitter power. The best information source is www.classaxe.com/dx/ndb/rna where you'll have to load either the call of the NDB or the frequency of operation into the search parameters and then the page will jump to the listing. You can also scroll down the complete listings of NDBs by frequency of operation. There are also notes regarding certain characteristics for some NDBs as reported by listeners. Classaxe provides the most up to date information on NDBs. Another navaid source for USA, Canadian and worldwide NDBs is www.worldaerodata.com . World Aero Data has almost all NDBs listed but you will have to click on the "Airport Call" to find the actual location. A lot of specific airport information can be gathered from worldaerodata. These two websites provide the "double-check" that is necessary to confirm the NDB ID heard on a specific frequency is the actual station received since there are usually several NDBs with the same call letters but never are identical IDs transmitting on the same frequency. Eventually, a list will have to be maintained in order to know when "new" NDBs are received. Knowing International Morse - NDBs seldom send faster than 10 words per minute, so it's not really much of a challenge to copy their call letters, especially since the NDB call sign is sent "over and over and over." When the signal is strong and there's no interference, copy is easy, even if your Morse ability is limited. Can you still receive and identify NDBs if you can't copy Morse at all? More than likely the answer will be yes, mainly because NDBs send so slow and the NDB call is sent "over and over." Since many private pilots were barely Morse proficient (if at all) the intention was that NDBs would send slow enough that the "dots and dashes" comprising the NDB call sign could be written down, e.g.," _.. _.. ._ _. ," and then "translated" into the letters (DDP) that identify the beacon. Being fluent in International Morse is a major advantage when trying to copy several NDBs operating on the same frequency. It's also helpful when the signal is so weak that it's practically at the same level as the noise and is fading into oblivion. I'm not saying that you have to be able to copy 20WPM in your head while having a conversation with someone else on the telephone but a good code receiving ability will ultimately help fill your NDB log. Even When You're Morse-Fluent - Every so often you'll come across a NDB sending incredibly bad Morse. From incomprehensible character formation to just plain poor spacing, it all adds up to an almost impossible call sign to copy. Fortunately, this only applies to a very small percentage of NDBs. Most beacons send excellent Morse but eventually you'll hear a call sign that defies copy. When this happens, copy the call as best you can but be sure to note the frequency of operation. Later, you can use "classaxe.com" to search on "the frequency of operation" to see if the call letters are "rearranged" due to poor spacing. There are several NDBs that have this problem, LDG 296kc is a good example. I've copied this NDB as "DGL" many times because of their spacing problem. Poor character formation is almost as much of a problem with NDBs like MNC 348kc sounding like "NNC" or POY 344kc sounding like "POC." Be sure to log the frequency along with the call. That way you might be able to decipher a questionable call sign when checking your reception list versus the NAV-AIDs. Again though, 99% of the NDBs send excellent Morse. *DGPS - Differential GPS,...see section below. Other Beacons - There other kinds of beacon signals that will be received on LW. Sometimes these are marine buoys that provide some navigation or hazard information in bays, lakes and other waterways. Most of the time it's next to impossible to find out the location of these particular signals that are obviously beacons of some kind. If the MCW ID is not listed in the NAV-AID sites, it does not mean that the signal received is not a legitimate beacon. Even legitimate airport NDBs sometimes aren't listed in any of the NAV-AIDs, like some "marker beacons." This can be an oversight or sometimes it's a new NDB (yes, there are new ones starting up with some regularity, even today - LYQ in Manchester, TN, for instance, just started up in 2008.) If the NDB heard is not listed in the NAV-AIDs, then try a web search on the NDB ID or try some of the web NDB logs to see if other listeners have heard the same station. Sometimes, though not too often, complete information on the NDB is found by this method. Part of the interest in LW listening is receiving weird and strange signals that are a challenge to identify. On the future of NDBs - Current US regulations state that if an NDB transmitter fails, the airport is not required to repair or replace their NDB station. Every month, more and more US NDBs are "retired" as obsolete technology since there are other more modern navigation signals available that are more accurate. However, many airports do select to maintain their NDBs as the operation costs are negligible and it provides a safety backup if the pilot has problems with his other air navigation equipment. It's up to the airport to decide if they want to continue to provide their NDB signal as part of a tradition of air navigation. Remote airports, especially in Alaska and in the USA along the Canadian border, seem to be more inclined to keep their NDBs in operation. DGPS Signals - DGPS, or Differential GPS, uses a somewhat local transmitter signal that works with satellite GPS to correct intended errors in the GPS satellite information. When GPS was being developed there was a concern that an enemy could use the GPS satellite information to accurately aim and deploy various types of weapons. To prevent accurate information from being available directly from the satellite, errors were built-in. These errors could then be corrected using local transmitters sending "correction" signals. This initially was for military uses but eventually also was to allow civilians to utilize the GPS information. GPS evolved over the years but still the DGPS correction transmitters are being used. There are 85 DGPS transmitters in the USA (some of which were converted from the 85 GWEN* nodes by the USCG.) Most are located along coastlines and some major waterways. Canada also uses DGPS along its coasts and along the St. Lawrence Seaway. There is a specific frequency band where the DGPS signals are located, 183.5kc up to 325kc. It depends where in the USA you are located just how much interference the DGPS signals impose upon reception of NDBs. Here in the Western USA, most DGPS signals are concentrated from 285kc up to 325kc. There are a few in the lower part of the DGPS band but the strongest signals are centered around 300kc (in the West.) As more and more demand for civilian GPS uses increase, expect to encounter more DGPS signals. NOTE: Although I hate to admit it, I've used the DGPS signal on 314kc as a receive "test signal" many times. That node is located near Sacramento, California and it's extremely strong here in Western Nevada. Since I know it's on 314kc and very strong, it makes an ideal "test signal" for the middle of the "NDB Band." When FCH 344kc in Fresno, California shut down (Jan 2018) I no longer had any NDB signal strong enough for daytime copy. Our strong local NDB, NO 351kc in Reno, Nevada, had shut down in August 2013 (and it's really missed.) DGPS 314kc is very strong and does provide a handy "test signal" for daytime use. *GWEN, or Ground Wave Emergency Network, was a LF military communications network that utilized of 85 transmitter nodes located within the USA. Each node consisted of a high power LF transmitter in the 170kc to 190kc part of the spectrum, a 200 ft tall tower/antenna and all of the support gear for providing emergency communications post-nuclear attack. Supposedly, LF was not vulnerable to damage from the EMP of nuclear detonations and could theoretically survive as an operational system. Military and presidential comms to SAC were intended but the system had many problems and, by 1994, had lost funding. The system was eventually shutdown. Many of the nodes were converted to DGPS use. Longwave Broadcasting - In addition to NDBs, there are foreign longwave broadcasting stations. These are only located in Europe, Africa or Asia. The stations run incredible power levels. One million watts of carrier power is common for longwave broadcast stations. Even though their power levels are extremely high, the signal's propagation faces severe losses and most longwave broadcasting is intended for regional service only. Here in the western part of the USA, it is possible to receive a couple of LW BC stations but those stations are never strong signals and rarely can the program be enjoyed. The strongest and most often received station here is Radio Rossii, located on Sakhalin Island (North of Japan) broadcasting on 279kc at a power level of one million watts. During the winter months in the early morning (~5AM PST,) Radio Rossii is very strong (for LW BC) and can be heard playing Russian pop-jazz music and reading their news service. These are always reports in Russian read by alternating male and female announcers with a short musical interlude between stories. Other LW BC stations are very weak and many times only the carrier can be received, the modulated information being too weak to really understand or even identify. UPDATE 2017: Radio Rossii on LW is gone for good. In fact, all Russian Long Wave broadcasting has stopped as of January 9, 2014. Only a few LW BC stations are active in Asia. Turkey has one and one in Georgia. Apparently these LW stations are too expensive to operate and maintain along with enduring a continuing loss of listeners that have gone to satellite or Internet services. Longwave Broadcasting's Future - It doesn't look good - Most of Asia no longer broadcasts on LW. Europe has about four stations still operating. The BBC-4 LW station is still running a vacuum tube transmitter and claims when the last tube goes, they are permanently off the air. They claim to have "bought up" all of the spare tubes available in world a few years ago,...and, apparently these tubes can't be rebuilt (more likely the BCC doesn't want to spend the money to have the tubes rebuilt.) When the Irish LW BC station, RTE-Radio One, shutdown a few years ago there was an enormous protest from the Irish in Britain that eventually got RTE-Radio One to reverse their decision to shutdown. The arguments to shutdown all LW BC are based on technology in that higher fidelity programming is available on Medium Wave (AM BC) or FM BC or Satellite or even the Internet. However, ardent LW listeners say "so what?" They don't want to change their listening habits. Even if the LW BC technology has its limitations it doesn't matter since most listeners aren't using new receivers anyway. Many are still using their old vacuum tube radio purchased decades ago. Expensive operation and maintenance cost when power level is at one million watts and the transmitter is of vacuum tube design seems to be the ever present threat that shuts down the LW BC station. At the present, the only thing keeping LW BC alive is their devoted listeners and those include still many maritime listeners. However, the end is probably "in sight" for LW BC. None of the stations want to upgrade their equipment since the future of LW BC is so bleak. Also, in many cases, the real estate that the massive antenna systems inhabit is probably worth more to the governments than maintaining "an obsolete technology" that benefits few and costs them so much to operate. "Lowfer" is a nickname for the LF enthusiasts that transmit 1 watt signals to 50 foot antennas in the 190kc to 160kc part of the LF spectrum. A license is not required to operate these transmitters because their effective radiated power (EIRP) is so low. The limitations have resulted in very clever ways of extracting very weak signals out of the noise in that particular region of the spectrum. QRSS, or very very slow CW, is one method used. It is so slow that a computer usually monitors the signal for several hours (all night) to assure that copy is possible. Other computer programs are also used to make possible copy of these extremely weak signals. Sometimes, when conditions are favorable, two-way "human" CW contacts do occur. Those are usually referred to as "Real Morse Communications" since so much on this particular band is computer driven and monitored for transmission and reception. Amateur LF Operations - The USA allows hams to operate on 630 meters (472kc to 479kc) in CW or data modes with five watts EIRP. Also, 2200 meters (136kc) can also be used with a limit of one watt EIRP. In other countries, 136kc is a ham band that can be used for fairly high power transmissions although foreign power limits are probably not using EIRP measurements. EIRP is Effective Isotropic Radiated Power and it takes into account that most antennas available to hams will be inefficient on long wave. EIRP allows hams to estimate how much RF power to apply to their antenna based on several physical factors applied to the antenna to achieve five watts effective radiated power. It isn't the actual power input (which is usually much higher) but rather the effective results of that RF power applied to an inefficient antenna. Time and Navigation Signals - WWVB (60kc) and JJY (40kc) are both pulse encoded time transmissions. JJY will identify their transmissions in CW at 15 and 45 minutes after each hour. WWVB provides no identification. Both WWVB and JJY can be received better if the BFO is turned on to demodulate what is basically a CW-type signal. There should be no problem with WWVB as its signal is extremely strong anywhere in the USA. JJY is a relatively strong signal in the Western USA in the early morning hours. Best reception is usually about an hour or two before local sunrise. 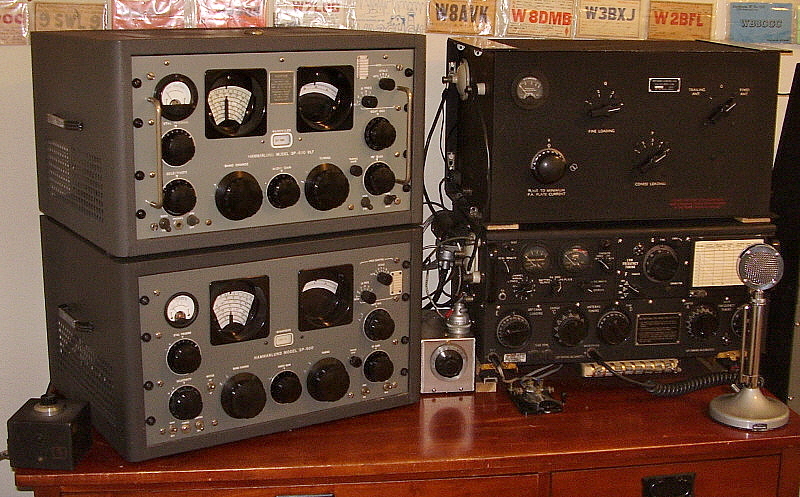 Loran C - All Loran C stations used to transmit on 100kc. The Loran C signal consisted of a precisely timed series of rapid pulses that both identified the station (as Master or Slave) and also allowed all Loran transmitters to be on 100kc simultaneously. The timing was critical and controlled by cesium-atomic clocks at each station. The shipboard navigation receivers were capable of identifying Master from Slave stations and designed to time the propagation delay based on "knowing" precisely when the pulses were sent and "timing" when they were received. Using the Master signal plus one or more Slave signals allowed the ship's navigation receiver to triangulate the wave fronts and determine their intersection point and the ship's position with an accuracy of around 50 feet, which in the ocean was pretty close. All Loran-C stations were shutdown in 2010 in what was mainly a political move that eliminated the last terrestrial-based, long-distance navigation system in favor of satellite-based GPS navigation. Computer Programs - There are several computer programs available that will demodulate many of the data transmission-type LF signals and allow the user to "view" what kind of information is being transmitted. In some cases, weather maps and weather reports can be printed out from NAVTEX. SeaTTY is one such computer program. USN MSK signals can't be decoded without special equipment, data reassembly programs, encoding data and other sophisticated encryption/decryption information. Nowadays, SAQ is probably the best known VLF station since they periodically run the only operational Alexanderson Alternator in the world. The mechanical transmitter can produce up to 200KW of RF signal on 17.2kc. The antenna system uses six 425 ft. tall towers supporting eight horizontal cables with six vertical drops. Each cross arm on each of the towers is 125 ft. across. SAQ was originally going to be built during WWI for communications to Great Britain, however delays postponed SAQ's completion until 1924. Communication to Great Britain and the USA was SAQ's primary use in the twenties and thirties. 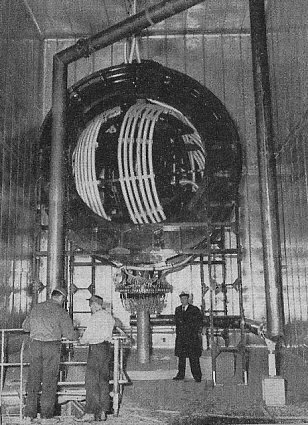 More radio transmitters were added to the facility over the years and by the late forties, Sweden was considering scraping the Alexanderson Alternator. Fortunately, it was instead preserved and maintained, eventually becoming a museum, as it still is today. SAQ operates twice a year. Once on Ernst Alexanderson's birthday (Alexanderson Day) in June and once on Christmas Eve. SAQ is difficult to receive anywhere in the USA. Upper East Coast USA is about the only location that generally can receive the transmissions, although one report of reception did occur in the Central Midwest one time. Also, SAQ has been heard in Alaska twice. The difficulty has to do with the 17.2 kc frequency which to successfully receive requires a superbly quite location and an excellent-efficient antenna. Mostly, it's the noise and the fact that SAQ is a third of the way around the world that makes reception virtually impossible in the Western USA. UPDATE: Oct. 2018 - I've heard that SAQ has been working on their antenna system to increase the effective radiated power. Supposedly they found several helixes were shorted due to corrosion. However, I can't find any confirmation of this work on SAQ's website. The website does however state that SAQ doesn't run the full 200KW but is usually running 85KW when transmitting on Christmas Eve and Alexanderson Day. Perhaps this accounts for the absence of confirmed reception in the Western US. UPDATE: Dec 24, 2018 - If you're planning on trying to hear SAQ's Christmas Eve transmission you should know that the transmission this year was actually Christmas Eve Morning, happening at 0900 hrs local SAQ time (which was UTC + 1hr.) To hear the transmission in the USA would require listening six hours earlier EST, or 0300 EST and nine hours earlier PST, or 0000 PST. There were several reports to the SAQ website from the USA this year. UPDATE: Mar. 15, 2018 - Bjorn, SM5UR, reported that there was a Swedish user, possibly military, that was associated with the complex at SAQ. They wanted (needed) to use the SAQ 17KC Antenna system and offered to rebuild the entire system. They use the antenna for their purposes and allow SAQ to run the Alternator for their schedules. Power has now been increased up to 160KW for the SAQ schedules and this has resulted in many more reception reports from North America. The US Navy has several MSK stations operating from just below 20kc up to around 80kc, used for world-wide communications with the Navy submarine fleet. MSK is a multi-layered, very narrow-shift FSK, called Minimum Shift (Frequency) Keying or MSK, a signal with only a few cycles shift and four layers of split-data combination to allow high-frequency information to modulate a low frequency of operation. Additionally, all transmissions are encrypted, so even if you could recombine the data, demodulating the MSK signal wouldn't provide anything understandable. There are two enormous VLF Navy stations operating in the continental US, one in Cuttler, Maine, NAA and one in Jim Creek, Washington, NLK. 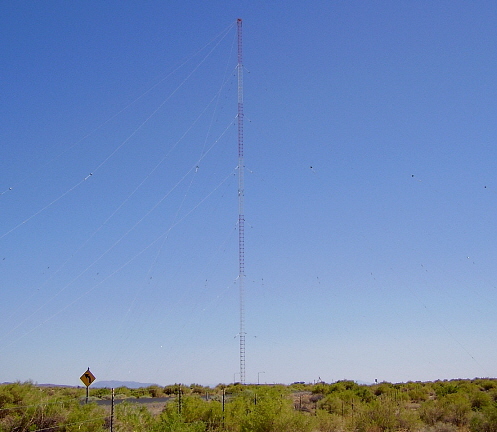 The two main continental US stations employ huge antenna arrays and can run close to 2 million watts. At Cuttler, two 500KW transmitters are set up on slightly different frequencies (only a few cycles difference,) one for mark and one for space (assuming RTTY coding is still used.) Each transmitter runs to one of two (North and South) six panel antenna arrays that are over 6000 feet across. Each panel is diamond shaped and the six panels form a "six-pointed star" shaped antenna system called a "trideco" system. 62 miles of one-inch diameter cables are used in the entire array. Each antenna array (six panels) is supported by 13 towers ranging from just under 1000 feet in height to just under 600 feet in height (26 towers total.) An incredible 6200 MILES of wire is used for the radial system that runs out into the sea surrounding the peninsula. For maximum power, two additional 500KW transmitters can be used bringing the total power up to 2 million watts. For de-icing the antenna array, a 60hz power plant capable of supplying 11,000KW (11 million watts) is connected to the antenna after the transmitters are disconnected. Special copper alloy cables and some tubular cables are used in the antenna array to provide enough resistance for the 11,000KW to rapidly de-ice the cables (usually 3 mega watts is used for de-icing operations.) Since their exact frequencies are published, tuning the the Navy stations NAA from Cuttler, Maine on 24.0kc or NLK from Jim Creek, Washington on 24.8kc, for example, will provide a good test for your receiving set-up. It's very rare not to be able to hear either Cuttler or Jim Creek - at anytime of the day or night. 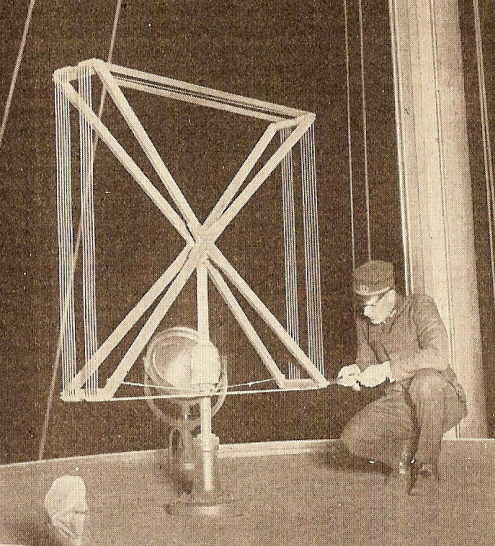 photo above: This huge variometer is wound with 4" inch diameter litz cable. It is used along with a helix and an inductive reactor to tune the NAA transmitters to the antenna arrays. This variometer is actually tuned remotely from a control station located about one mile away. The entire antenna array (both North and South) spans approximately three miles. 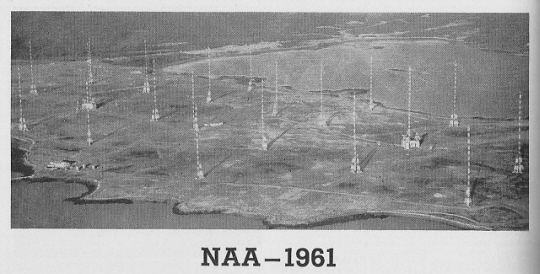 NAA went on the air in 1961 but NLK in Jim Creek, WA is actually the older VLF station having gone on the air in 1953. NLK runs 1 million watts to a dual antenna array that spans a valley between two 3000 ft elevation mountains in Washington. Additional USN MSK Stations - NPM operates on 21.4kc coming from Lualualei, Hawaii. 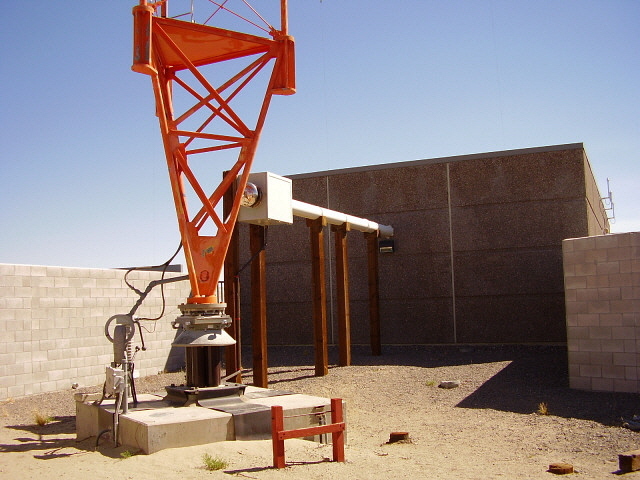 NPM is a USN MSK station running around 550KW to an ground-isolated vertical antenna with wire capacity hat system. NPM is usually a strong signal in the west. Also, on 19.8kc is Harold E. Holt, a MSK station from Exmouth, Australia. Holt is a USN station that is operated by the Royal Australian Navy. The Holt antenna is a single trideco (six pointed star) type. Holt can usually be heard in the west, not as strong as NPM ,but still it can be heard. On 25.2kc is NML, a USN MSK station operating from Lamour, North Dakota. NML is usually strong here in the west but it's operating frequency is very close to the incredibly strong NLK in Jim Creek. Sometimes it's difficult to tell where NLK stops and NML begins. The USN also has various other MSK stations that operate on random schedules and frequencies. I've heard MSK signals with some regularity on 51kc. This used to be a USN station located in Dixon, California but it's regular operation was shutdown several years ago and now it may be in the "test or emergency" type of operation. As usual,...there was a lot of opposition to having US amateurs transmit below 1800kc. It took five years to get FCC approval but still there's some "red tape" in the form of contacting the Utilities Technology Commission for final approval of your intended operation. The ultimate factor in the UTC decision for each individual ham operator will be his station's physical location. Online forms and e-mail makes the process of dealing with the UTC easy. Five Years Later - Here's the Process - It's become a fairly easy process to get on 630M or 2200M. As far as the FCC is concerned, general and extra class hams can operate on 472kc to 479kc in CW or data modes and run 5 watts Effective Isotropic Radiated Power, otherwise referred to as EIRP. 2200M is 136kc and the modes are the same but the power limit is 1 watt EIRP. You don't have to contact the FCC about operating either band. The FCC has deferred final approval to the Utilities Technology Commission (UTC.) The UTC is a political lobby concern whose primary interest is to promote business and commerce for the various Utilities. They aren't particularly interested in ham radio unless it adversely affects the operations of the various utility companies. The UTC concern is interference with Utility troubleshooting data and other data that is sometimes on some types of power lines. Whether or not an individual ham would cause interference (at 5 watts EIRP) is dependent on their station's physical location in relation to data-carrying power lines. The UTC requires your station location to be more than one kilometer from any data-carrying power lines. The UTC requires your station antenna location referenced by GPS coordinates in degrees, minutes and seconds. From that information, they either approve your intended LW operation or not. The UTC website provides a form that can be filled out online and sent automatically to the UTC. If you don't hear anything back in the form of an e-mail within six weeks (howcome so long?) then consider that your station location is fine and "you are approved." Assume that you will be contacted by the UTC by e-mail if you are within one kilometer of data-carrying power lines. The online form allows for simultaneous approval for both 630M and 2200M operations. 630M Success! - I set up a sked with Mel, K6KBE (QTH: Ione, CA) to see if he would be able to copy my station on 473.5kc. Our sked was for 0600 on March 15, 2018. I was to send CW consisting of "V", "TEST", "de WA7YBS" and QSL information. The transmission lasted about five minutes with all of the text repeated three times. Mel reported his reception to me via e-mail and indicated that he heard me "come on" at 0600 "straight up." RST was 419, which doesn't sound that great but, on 630 meters at a distance of just over 100 miles, that's success. Mel is working on his 630 meter antenna which still needs a loading coil to function correctly. Weather has been his hold up. When Mel is able to transmit we'll go for 2X Morse on 630M. Successful two-way CW on 630 Meters! - Mel and I set up a CW sked for 0600 for April 2, 2018. Mel was using a homebrew transverter and a "loaded" 75 meter antenna. I called "K6KBE de WA7YBS" at 0600 and Mel came back with a RST 549 signal that sounded strong and in the clear. Conditions were good at this point. Mel gave me a RST 549 also. Next go 'round the QRN started up but copy was still solid. Mel's transmission was that "QRN got u" and he was missing quite a bit of what I sent. Our 73s completed the short QSO. Just over 100 miles and a two-way CW QSO on 473.5khz. That night, at 2000 PDT, there was a West Coast 630M "get together" on CW 473.5kc. I heard W0YSE tuning up but he was too weak to copy. He was answered by K6KBE and Mel's signal was incredibly strong, 589 or better. I had the loop antenna pointing SW in Mel's direction which obviously helped his signal and was probably why W0YSE was too weak to copy (YSE's QTH is in Washington state, should have been pointing N.) I know,...why didn't I move the loop? A six-foot loop in the house is pretty difficult to reorient. Dec 8, 2018 - Sked with K9KFR, Bob - 473.5kc 19:30PST not successful. Busy night on 473.5kc. Dec 27, 2018 - Sked with W6DJX on 473.5kc at 19:15 PST. Hank was RST 549 here, he could hear me - barely, couldn't really copy me though. The station consists of two Hammarlund SP-600 receivers. The top receiver is the SP-600VLF-31 tuning from 10kc up to 540kc. The bottom receiver is the Hammarlund SP-600 JX-21 tuning from 540kc up to 54mc. The small box to the left of the JX-21 is the remote tuning for the six-foot loop antenna used on 630M for reception. The HF receiver output is to a floor speaker. The LF receiver output is to 600Z ohm 'phones. The transmitter is an ART-13A with O-17/ART-13A LFO installed allowing operation from 200kc up to 600kc. On top of the ART-13A is the CU-32/ART-13A Antenna Loading Coil. The CU-32 allows the ART-13A to match a variety of antenna types on LF. Both the HF output and the LF output from the ART-13A are routed through the CU-32. In my setup, the output of the CU-32 is connected to the HF antenna when "FIXED ANT" is selected and is routed to the 630M antenna when "TRAILING ANT" is selected. 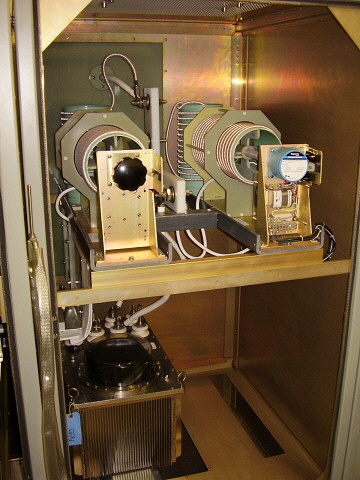 The silver box to the left of the ART-13A is an auxiliary condenser that aids in loading the transmitter on 75M. The J-38 hand key is for LF-CW and the mike is for HF phone. LF transmitting antenna is an end-fed wire 166 feet long. HF antenna is a 135' CF Inv-vee with 99' of ladder line to a Viking KW tuner. Effective Isotropic Radiated Power? - Why use Effective Isotropic Radiated Power to set the power limit of 5 watts? This regulation is a method to limit the EM radiation of the transmitted signal to a certain level by control of the relationship of the RF power input to the antenna versus the antenna's physical size and how that size relates to antenna efficiency. Consider that a full-size 630 meter half-wave antenna is over 1000 feet long. This type of "full-size" antenna might actually exhibit a slight gain when compared to an isotropic radiator (dependent on other losses.) Therefore, the power input would have to be 5 watts to stay within the regulations (assuming no other losses.) With a full-size, efficient antenna, even just 5 watts input could result in a formidable signal on CW. However, an antenna that will fit onto a typical city lot will be very inefficient at 630 meters and therefore would exhibit a considerable loss rather than gain. That's how the RF power input to a "small" antenna can be fairly high and yet only result in 5 watts EIRP. Think of the small, inefficient antenna as being like a "dummy load." You can input lots of RF watts into a dummy load and the dummy load does radiate a few feet but it isn't an efficient radiator. So, to stay within the regulations, one has to estimate the efficiency of their antenna and then calculate the amount of RF power input to that antenna versus its efficiency that would result in five watts EIRP. The efficiency is primarily determined by antenna size, antenna height and antenna resistance. There are other variables but it's best to ignore those since they involve soil conductivity, losses due to nearby objects and other things that "vary" all the time. The best info I could find is at www.472kHz.org under "Antennas for 630 Meters" and "EIRP." The formulae are explained in detail and four "real antenna" examples are shown to help answer "the EIRP question" for your particular or proposed set up. Military Transmitters on MW - Thoughts on future 630M Operation - Although it's fun to operate the ART-13/CU-32 combo on 630M it isn't the most comfortable transmitter to use. The problem with the ART-13/CU-32 is the sending relays. There are three, the ART-13 sending relay, the ART-13 vacuum antenna switch and the CU-32 vacuum antenna switch. Each dit or dah actuates these three relays and the resulting din is very loud and eventually becomes irritating. Sending CW is difficult due to the distraction of all of the noise going on at the same time. Using 'phones and monitoring the signal helps but, still, who wants a cacophony of noise going on at 11PM. Unfortunately, most military transmitters from WWII use the same method of "break-in" keying. The BC-375/BC-191 uses a rotating sending relay but it's just as noisy as the ART-13. >>> >>> The solution is to homebrew a 630M CW transmitter. Over the summer of 2019, I plan to design and build a tube-based transmitter, probably crystal-controlled since I do have some suitable crystals in the 470kc range. Keying will be quiet. Operation pleasant. Late-evening QSOs, not a problem. The transmitter will be table-top size, look vintage and operate on 120vac. Built-in power supply and several meters (personal favorite,...lots of meters.) I'm thinking about changing receivers from the SP-600VLF to the Collins R-389 as the station receiver, too. Hopefully, these upgrades will make the 2019-2020 630M season more interesting and successful. UPDATE - More thoughts: I've been looking at the 1937 Utah UAT-1 transmitter. It's crystal controlled, CW only and uses plug-in coils. I've collected the larger size Hammarlund coil forms with the intention of winding coils for 630 meter operation. The UAT-1 is cathode-keyed so there's no noise. Crystals determine the transmitted frequency. Plug-in coils determine the Oscillator grid tuning, PA grid tuning and PA output tuning. With a 6L6 Osc and a pair of 6L6 PA tubes, the UAT-1 will do about 50 watts output. I'll have to rework the balanced tuner and change it to an "L" network. Experimental License Grants from the FCC are not "amateur licenses." You have to have a specific purpose or experiment that is described in the application. You have to describe your specific location, your station and your antenna within the application. You should be either a college or university,...or maybe a business that does R&D work. In other words,...you need a "good reason" for applying ("amateur communications" is not a good reason.) You can submit your request to the FCC "on line" and the cost is $65. Again,...these are NOT amateur licenses, they are licenses to conduct research, experiments and testing and all of your intended equipment and operation has to be described within the application. Grants are for 24 month periods that can be renewed,...maybe. Time from submitting the application to receiving the grant is from one to three months. The Longwave part of the RF spectrum can be very noisy with intense static making copy difficult. In an extreme RF noise generating environment maybe all that will be heard is intense "buzzing" any where you tune. These factors can pose anywhere from difficult to solve problems up to impossible to solve problems when using any type of equipment to tune in LW signals. So, does vintage LW gear respond any better or is it actually worse when used in a noisy environment? Most WWII LW equipment will have some kind of noise limiter and also some filtering though they may be of little use against the types of noise encountered today. Fortunately, most of the intense noise found on LW is originating from our own houses. Light dimmer switches are notorious for producing a loud "buzzing" RFI on LW. Certain kinds of controllers that have neon pilot lamps (the orange glowing light) can also create RFI noise. Florescent lighting, certain types of illuminated clocks, computers and monitors, burglar alarms, grow-lamps, "wired" smoke-detectors, switching power supplies including some types of "wall wart" power supplies and some types of CFI lamps - all of these (and probably more) can produce RFI noise. Additionally, modern efficient furnaces that are multi-stage and modulate the blower speed can cause some RFI. This generally is heard as a changing pitch to the RFI as the motor speed changes. The newer the furnace, generally the less RFI will be encountered. RFI is also dependent on how the thermostat controls the blower and burner modulation. Although the list of RFI appliances keeps increasing and sometimes it seems like an impossible challenge, cleaning up our own houses for RFI noise is the first step towards successful receiving of LW DX. Another noise producer is street lamps - not when they are operating correctly but when they are malfunctioning. Usually before the street lamp goes out altogether it will cycle on and off with a time interval of about 30 seconds to one minute on the start-up cycle. During this time intense RFI is emitted. It's amazing how far away the malfunctioning street lamp can be and still create RFI at your location. Expect intense RFI from a street lamp within your block. Fairly intense RFI from two to three blocks away and nuisance RFI from four to five blocks away. Some receiver noise limiters can reduce the interference but early LW receivers with no filters are useless during the lamp's start-up cycle. Most of the time the failing street lamp will cycle on and off every couple of minutes, all night long. Normally, if you call the power company they will come out and replace the failing lamp. You will have to have the street lamp ID number that is located on the underside of the assembly by the lens and also the street location (the ID number is visible from the ground looking up.) Fortunately for LW listening, the most intense RFI from street lamps is located in the frequency range from about 450kc up to about 4000kc. Some of the LF RFI noise is on the power lines. There is a tremendous amount of data that is "riding" on the AC power lines. This is in the form of some controlled-carrier information, test and troubleshooting data, time setting information and, in some areas, broadband on the power lines. Some of the data exchanging on the power line is via the "smart meter" that has replaced the old electro-mechanical power meters can also cause RFI. The quieter your receiving area is, the more likely it is that you'll notice some type of power line noise, especially if you use an end-fed wire antenna. Since there are so many LF RFI noise sources today, especially within urban areas, just about the only practical relief will be by using a tuned-loop antenna. In extremely noisy locations the only solution might be to use a shielded-magnetic loop antenna. The shielded-magnetic loop antenna will use a non-ferrous metal loop-tube that almost entirely encloses the loop antenna wires that are inside. Since the antenna is electrically "shielded" but not magnetically "shielded" it responds mostly to the magnetic portion of the electromagnetic signal. Since most man-made RFI is electrical in nature, that noise is shielded by the loop's enclosure. However, all shielded loops will have some kind of signal amplifier that is either "tuned" or is somewhat "broadband" due to the limited response because of the shielding that almost entirely encloses the antenna itself. In many urban areas, only these types of antennas can provide relief from RFI and allow reception on the lower frequencies. Unfortunately, most commercially-made shielded loops are fairly expensive (~$500 and up.) In less severe noise locations, a simple tuned loop can provide a major improvement over a wire antenna and allow reception of very weak signals. Remember, none of these loops will produce stronger signals at the receiver if compared to a large wire antenna. However, in a RFI-noisy area, the loops will provide a much lower noise level and allow you to hear weaker signals. In a RFI-quiet area, a large wire antenna will provide strong signals significantly above the noise and will probably out-perform the loop. Though LW stations can be tuned in using almost any type of antenna, a fairly large "Tuned Loop" generally provides the user with low noise reception due to its high Q, high selectivity. Another advantage is the ability to null out noise if it is from a particular direction. Most man-made noise will be somewhat directional and possibly could be nulled out. The selectivity of the loop will help with atmospheric noise by increasing the receiver's response to the tuned frequency and increasing the signal to noise ratio. However, the loop antenna must be physically large enough to respond well to very weak signals. Usually three feet up to ten feet is sufficient size for good DX response on MW. The End-Fed Wire is generally any wire antenna that has no feed line - one end of the antenna connects directly to the receiver antenna input. Usually, EFW antennas are between 75 and 150 feet in length due to physical limitations of the user's property size. Since it's unavoidable that some of the antenna is going to be inside the house, noise levels on EFW antenna are generally high. Below 500kc, most EFW antennas are going to be "short" and exhibit none of the advantages of typical "long wires" used on HF. However, long (that is, a few hundred feet long or more) EFW antennas do provide better signal to noise performance than the typical short EFW and in some quiet locations might out-perform a tuned loop that's used in a poor location. Extremely long, "Beverage antennas*" perform entirely different (much better) than the typical, short (for LW) End Fed Wire. The EFW's advantage is ease of installation and, even if the antenna is not tuned, it will still give a fairly consistent response throughout the receiver's tuning range. However, because of this wide response and lack of a feed line, it's susceptible to all kinds of noise - made man and atmospheric. While it's interesting to compare the two antennas, I have found that almost without exception a well-designed, fairly large, tuned loop antenna will always seem to outperform almost any end-fed wire when comparing signal to noise ratio (not necessarily signal strength.) This is especially true with more modern receivers - the newer the receiver's design, the better it usually works with a tuned loop antenna. Very early three-circuit tuner regenerative receivers (1920s) seem to be much happier with long wire antennas of various configurations rather than the relatively small tuned loop antennas. However when using WWII or later vintage receivers, either regenerative or superhet, generally the tuned loop antenna provides the low signal to noise ratio necessary for successful DX NDB station copy. Be sure to read the next section, "270ft Long Center-Fed Wire Antenna," as this provides an example of what a sizeable wire antenna can do on LW in a RFI-quiet area. *The Beverage antenna (developed by Harold H. Beverage of RCA) is a one to two wavelength long antenna that is terminated to ground on its far end with a 450 ohms non-inductive load resistor. The Beverage antenna is mounted fairly close to the ground with 3 meters specified, although not too much difference in performance is noted with heights from 6 to 15 feet above the ground. Any higher and the antenna will begin to pick up noise. Beverage antennas are directional off of the terminated end. If the 450 ohm resistor is removed the antenna will become bi-directional off of the ends. Beverage developed the antenna for low noise reception and competitive performance. Two wavelengths is the specified maximum length according to Harold Beverage. During the next few days, while I was repairing and aligning the RBA-1, I would test the results using this antenna system. I was completely surprised when I started receiving NDBs from Idaho during the day. The big surprise was the next afternoon (13:30) when I tuned in DC 326kc from Princeton, British Columbia. Finally, when I had the RBA-1 finished I ready to do a serious test the following morning. From 05:55 to 06:35 in the morning I tuned in 47 NDBs in about 40 minutes and five of those NDBs were newly heard ones (#305 to #309 for the total tuned NDBs.) Greatest DX was POA in Hawaii and DB in Burwash Landing in the Yukon. Almost all signals were quite strong and nearly all stations had one or two other NDBs on the same frequency. Another surprise was receiving the first ham signal I'd ever heard below 500kc. WH2XVN in Burbank, CA on 183kc. To determine if this performance is a result of the antenna or the receiver will require another test. This time using the National RBL-5 receiver. This antenna forms a "T" which might be considered a vertical with a large top hat. This is the typical antenna used at many NDB sites. 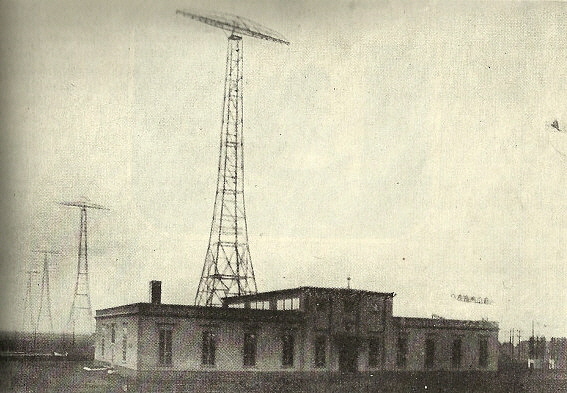 Most antennas from the early radio days had a two to three wire horizontal separated with spreaders on each end. Then the center of the "flat top" was tied together and fed with a single wire dropping down to the radio building. More testing is necessary to determine if this antenna configuration will continue to provide a relatively low-noise operation. Much of the RFI that plagues smaller outdoor antennae and even the tuned-loop (when used indoors) seems to be greatly reduced, especially in the 190kc to 300kc region. I also would like to check if the feed line is shorted at the feed point of the horizontal wires thus making the antenna a true "T" wire, if the performance remains unchanged. This large wire antenna can be connected directly to a substantial earth ground when not in use. The counterweight system seems to keep the antenna stationary as the wind runs the weights up and down as the tree limbs move around. The upshot here is,...when conditions are great this 270' x 77' "T" antenna is unbeatable. BUT, if anything does "beat" this antenna, it's noise,...not RFI but atmospheric noise. This is mostly caused by the ionosphere but it can also be weather-related. photo above: The 6' loop (measured across the diagonal) uses a 3/4" pine board center piece to hold the four 3' long arms that are made of 1x2 redwood. The gray box contains the varactor diode board. The gray cable is the bias supply from the remote box at the receiver location. The black cable is RG-58U routing the pick-up loop signal to the receiver. Cables can be any reasonable length but since this loop is near the receiver, the cables are about 20' long. The loop has a base (not shown) to allow it to free-stand and be pointed in any direction. The "diamond" shape orientation seems to work better than the "square" mounting by providing slightly lower background noise and slightly stronger signals. My first tuned loop antenna was a ten foot in diameter octagon with 12 turns of 20 gauge stranded wire remotely tuned with variable bias supplied to MVAM-108 varactor tuning diodes. The bias control, or tuning, was located at the receiver position for ease of operation and the bias voltage ran to the antenna via RG-58U coax cable. Tuning range was from 135kHz to 400kHz and by shorting out a turn on the loop the upper end of the range was increased to 500kHz. A 9' diameter single turn pick-up loop was mounted inside the 10' loop and was fed directly to the receiver's antenna input via RG-58U coax. This antenna performed very well with WWII vintage regenerative TRF receivers. Though the 10' loop antenna provided great signals it had a couple of problems. First, due to its size it was non-directional. That might be considered an advantage since I didn't have to provide any method of changing where it pointed. Second, due to its size it had to be located outdoors where it was highly susceptible to strong wind damage. After repairing the wind-broken 10' loop several times, I decided to rebuild the loop into a smaller configuration. This would result in a stronger antenna and would also result in some directional characteristics. The new loop is a square with four foot sides and six feet across the diagonal. 17 turns are used in the antenna portion of the loop. A separate pick-up loop couples the signal energy from the tuned antenna where it is then routed to the receiver. I initially tried a single turn pick-up loop but found the signals were too weak. This was probably because of the very low impedance of the single turn, its physical length only being about 16 feet. I ended up using a three turn pick-up loop and found this gave much better performance. The pick-up loop is fed with RG-58U and connects to the receiver in use. The loop itself is connected to a small plastic box that contains the varactor diode board, connectors and a switch that selects the tuning range. The loop is tuned by varying the bias voltage (0 to +9vdc) on the varactor diodes. The frequency range is from approximately 195kc up to 440kc in two tuning ranges. This loop antenna is very directional and strong stations that are perpendicular to the antenna axis can almost be nulled out. Since this loop is relatively small, I have it indoors in the same room as the receivers. This location has eliminated the wind damage issue. Rotation is manual and since the upstairs floor is wood, I can set the antenna on the floor with no noticeable losses. In operation, signals received on this indoor 6' loop with a three turn pick-up are just about as strong as the outdoor 10' loop was and since it is directional it has the added advantage of increased signal strength when pointed towards the signal source. Loop Details: The spacing of the loop wires is not especially critical. About .25" seems to work fine. If the wires seem to get tangled, again, this doesn't really seem to affect antenna performance much. The combs that keep the wires separate are made of .25" thick oak and have sawn notches for the wire mounting. The combs are held in place at the arm's end with glue and screws. To achieve two tuning ranges, I use switched parallel varactor diode sets. The capacitance for a single set is about 30pf to 300pf and a parallel set is about 60pf to about 500pf. The switch is located at the antenna box which would be inconvenient if the antenna wasn't indoors. I use a 9vdc transistor battery as the bias voltage source and a ten turn, 10K pot with some limiting resistors to control the bias voltage to the varactor diode junctions. 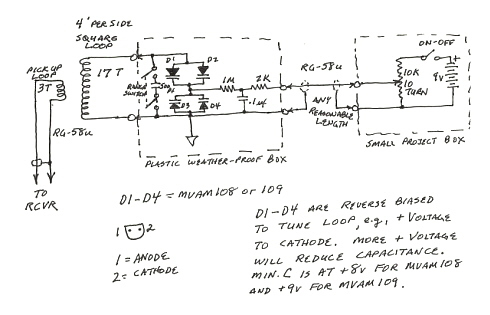 Schematic for Loop Remote Tuning - Shown to the right is a schematic for a very simple way to remotely tune a loop antenna by using varactor diodes. As described in the section above, this circuit can be built into a weather-proof plastic box that can be mounted at the loop. RG-58U coax cable can be used to connect the box to the remote tuning box that will be mounted beside the receiver. A standard project box can be used for the remote tuning box. Battery voltage is provided with a nine-volt transistor battery and tuning is accomplished with a ten-turn potentiometer. The remote tuner is also mounted inside a box for ease of operation. An "ON-OFF" switch is provided to isolate the battery when the loop is not being used. The coax can be any reasonable length. The longest I've used is around 50 feet with no problems. You can use PL-259 connectors on the coax and SO-239 box connectors on the remote tuning box and the loop box. The resistors and the capacitor are not critical and only provide a filter for the bias supply to the varactor diodes. I used three turns on the pick-up loop as I found two turns didn't provide strong enough signals. Best results will depend on the antenna input Z of your receiver. To increase the lower end of the tuning range it is possible to switch in a fixed 500pf silver mica capacitor in parallel with the loop terminals. This will reduce the overall tuning spread but will lower the frequency bottom end by about 40kc or so. As shown, the loop tunes 240kc up to 440kc. With a parallel cap switched in, the low frequency is 195kc. If the parallel cap is added a double switching arrangement can be used for better isolation. A higher value cap can be installed to lower the bottom end frequency more if desired but the variable tuning range will decrease as the frequency is decreased. A three position switch (with an off position, too) could be installed to allow a selection of 500pf, 1000pf and 1500pf fixed value capacitors to allow loop tuning to go down to about 150kc or so. Additional Loop Antenna Information as of Jan. 29, 2009: I'm very pleased with the performance of the six-foot loop. I really think its performance is at least equal to the ten foot loop that was mounted outside and, many times, I think it's actually better. During the past two months (12/08 and 1/09) I have logged over 100 new NDBs using the 6' loop. That's not total NDBs heard - it's just new NDBs I hadn't heard before. Best DX was YY 340kc in Mont Joli, Quebec at around 2500 miles. Also, in the other direction, LLD 353kc at Lanai City, Hawaii - also around 2500 miles. Greatest DX wasn't a new NDB for me - it was DDP 391kc in San Juan, Puerto Rico at around 3500 miles - but DDP is a transatlantic beacon running 2KW - it's not hard to receive. I think the main advantage of the six-foot loop is the ability to point it in the direction of the stations and exclude other stations that are perpendicular to the antenna axis. LLD is a good example since Reno's NDB NO is very strong and transmitting on 351kc and LLD is on 353kc. LLD is a transpacific beacon running 1-2KW and would be an easy copy if NO was not a local NDB. Fortunately, those two NDB signal paths are physically about 90 degrees apart at my location so I can somewhat null NO and copy LLD by pointing the loop SW. Signal levels on the six-foot loop are about the same as the ten-foot loop was. The receiving limitations are primarily the atmospheric noise and relative conditions, then local noise and finally the receiver's ability to pull signals out of the noise. The RAZ-1 is very good at weak signal detection. UPDATE - 2015: I've used this loop antenna with many different LW receivers and it seems to work quite well with just about any receiver. When I acquired the Hammarlund SP-600VLF receiver I found that the loop acted differently with respect to the apparent Q of the loop with tuning seemingly so "broad" that it was difficult to find a "peak." I ended up removing one turn on the pick-up loop and with two turns, the loop "peak" could be tuned although it was still somewhat broad. The recommendation is that depending on your receiver input Z you may have to work with the length of the pick-up loop (number of turns) to determine optimum tuning response. UPDATE - 2018: I've been having trouble with the loop working well with two receivers. The SP-600VLF seemed to make the loop very broad tuning with difficulty finding a "peak." I removed one turn on the loop which helped a little. Then with the R-389, I didn't seem to have enough signal strength from the loop. To try to "fix" the two problems, I've now increased the number of turns on the pick-up loop to four to increase gain. In order to increase selectivity, I've reduced coupling by reducing the size of the pick-up loop. It had been spaced about 1.5" inside the primary loop. I've doubled the distance so now the pick-up loop is 3" inside the primary loop. I'm hoping that the four turns results in strong signals and the greater distance will make the loop "tune" sharper. In a quick test I tuned the R-389 to the nearby DGPS 314kc node as a test signal during mid-day. The loop peak tuning showed 25db on the carrier level meter. As a reference, the 135'x100' "T" outdoor wire antenna showed 40db. The tuning Q didn't change too much but with the R-389 the peak is easy to find. Further testing will reveal if this change benefits DX reception for both the R-389 and the SP-600VLF. November 5, 2018 using the SP-600VLF and the loop I was able to copy NO3M on 473kc. His QTH is Pennsylvania. I'd say the loop works fine with the SP-600VLF. However, the R-389 still favors a wire antenna. Several years ago, N7ID loaned me a Hewlett-Packard 461A Broadband Amplifier to use with the RAK-7 receiver I was then using for longwave. I installed the 461A between a wire antenna and the receiver. All I got was a tremendous increase in noise and not much, if any, signal gain. I returned the 461A and didn't think about that type of amp again. A few years later I had tried a homebrew solid-state amplifier on my six foot remotely tuned loop but its performance was terrible. It seemed to have so much gain that I'd tune in the AM BC band stations along with various NDBs. Recently, I began thinking about the HP 461A again. When I had used it before, it was an untuned input coming from a random length wire antenna. If I installed the 461A with the loop's pick-up loop as the input that would add the tuned frequency input ability of the main loop along with the pick-up loop's selectivity. This would tend to reduce the amount of noise while enhancing a specific tuned frequency. The output of the 461A would be connected to the antenna input of the receiver. 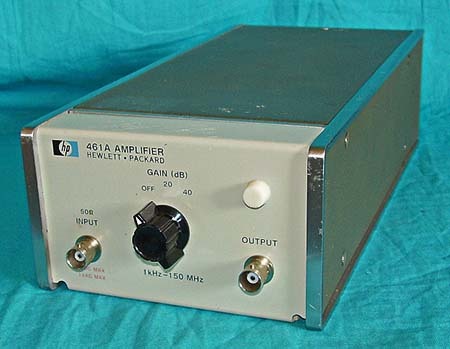 HP-461A Specs - These small solid state amplifiers had a built in power supply and had selectable fixed gains of either 20db or 40db. Input and Output impedance is 50Z ohms. Frequency bandwidth is 1Khz up to 150Mhz. The input voltage limit is 2vdc and 1vac. Performance - For the first test I used the Collins R-389 and a 160' End-Fed Wire. This is about as noisy of an antenna that can be found. With the 461A connected between the EFW and the receiver all that seemed to be increased was noise. Signals that were audible disappeared into the noise with 20db of amplification. Next, I substituted the loop antenna and tuned in the DGPS node on 314kc. It was pretty strong with no amplification and very strong with 20db but with 40db of amplification the input overloaded the receiver and the signal seemed to disappear. Returning to 20db and then the 314kc node was again present. At 2230 hours I tuned in NDB MOG 402kc. I showed about 20db on the carrier level meter (a strong signal) without the 461A on. With 20db of amplification, as one would expect, the meter read 40db. But, if 40db of amplification was selected, then the signal disappeared because the input was so strong that it "blocked" the receiver front end. >>> UPDATE: Oct 1, 2018 - I tried the HP-461A with the modified loop antenna this morning. The pick-up loop turns have been increased to four turns and the coupling has been reduced by moving the distance between the tuned loop and the pick-up loop to 4.5." As noticed before, it's a fine line between adjusting for a weak signal increase or just amplifying the noise. Conditions weren't great but still a lot of DX NDBs were being received on the "T" wire antenna. The loop without the 461A was about 15db below what the wire would receive. With the 461A inline I had tuned in ZP 367kc in Sandspit, Queen Charlotte Islands. BC. By reducing the RF gain down slowly, a "sweet spot" could be found where the noise was low and the signal in the clear. Without the 461A, using just the loop, ZP was not received. However, when connecting up the "T" antenna, ZP was extremely loud and significantly above the noise. The 461A can provide an advantage in some conditions. As with any Long Wave listening, at different times, different antennas or combinations will seem to perform better than others. The final necessity for successful reception of weak LW signals is using the proper audio output reproducer. If you use a loudspeaker you can just about eliminate 70% of the NBDs that you would probably hear if you used headphones. Nearly all of the DX NDB signals are weak in signal strength. Most signals are in the noise. Much of the time you are trying to copy the weakest NDB that's on the same frequency as a couple of strong NDBs. Listening with a set of 'phones enhances your perception when copying weak signals that are buried in QRM and QRN. Most vintage military LW radio receivers provide a 600Z ohm audio output. Finding a set of 600Z ohm 'phones is pretty easy. If you are looking at the WWII military headsets that provide a short cable with a small phone plug that then plugs into a six-foot extension cable, then you look at the color of the small phone plug shell. If it's red then it's Low-Z or 600Z ohms, if the shell is black then the 'phones are Hi-Z or around 10K Z ohms. This color code only applies to WWII 'phones. Later, in the 1950s, 600Z 'phones were considered Hi-Z, so these types should be measured to verify actual impedance. Most early vintage LW receivers have high impedance outputs that might have the 'phones connected directly between B+ and the audio output tube plate. You must use Hi-Z 'phones for this type of receiver. Generally the older style 'phones work fine, especially those from the 1920s that were designed for direct B+ to plate connection. >>> >>> If the headset is not marked then measure the DCR at the connecting plug or the phone tips to determine the probable impedance. Hi-Z phones will measure above 1K ohms DCR while 600Z ohm phones will measure around 100 ohms DCR. If you measure a very low DCR (< 5 ohms) then the impedance is 4 or 8 ohms. This test is an approximation to estimate probable impedance. Remember, 'phone impedance is "nominal impedance" and dependent on what frequency is used in the calculation. Generally, nominal impedance meant that the specified Z was the lowest Z that the would be encountered when the 'phones were used in a standard configuration listening to average signals at average levels. Pretty vague,...so don't take the specified Z as something that is ultra-critical,...close is okay. Once you have your 600Z ohm 'phones, check the schematic on your particular LW receiver to see how the audio output is designed. Most military LW receivers were designed for "headphones only" use and the 600Z ohm audio output is at the phone jack on the front panel (usually.) Later LW receivers might have the phone jack connect to the 1st AF stage or the second detector (on a superhet) and it might be that the phone jack might have circuitry added to assure that the headset is not "over-driven." Best results will be obtained by connecting the 600Z ohm 'phones to the "actual" 600Z ohm audio output stage. This may or may not be "at the phone jack" so check your receiver's schematic and connect your 'phones to the "actual 600Z ohm audio output." IMPORTANT NOTE: You'll have to be very careful and only use just enough gain to hear the average noise level in the receiver output. Even then, sometimes "pops" and "clicks" can get thru the Noise Limiter and "over-drive" your ear drums. ALWAYS keep the 'phone cups somewhat in front of your ears to avoid problems. You don't want a "full seal cup" around your ears, so don't use rubber cushions or padded cushions that provide an air seal surrounding your ears. That directs the sound pressure from an intense "pop" directly down your ear canal with "ringing ears" sure to result,....even worse if you allow this to happen multiple times. Always use "bare" phone cups just in front of your ears and resting on the rear part of the cheek bone. You hear the CW thru a combination of "bone conduction" hearing and partial 'phone leakage to the ear. It works! On February 8, 2010, I tuned in Loran-C Master Station 'M' at 8:30AM PST and it was operating as usual. Tuning in later in the afternoon, at 5:15PM PST, Master Station 'M' had ceased operating. In August 2010, it was noted that Station 'G,' the last remaining West Coast Loran signal, was not transmitting. Consider all Loran-C operations "OFF THE AIR"
Above: The Loran C antenna from main gate. The mast is 625 feet tall with each side measuring about six feet across. The capacity hat is about 900 feet diameter and is formed by the 24 top cables drooping down to large isolators. The size of the installation can be compared to the street lamps near the base of the antenna and just visible is the roof of the station house. Just outside of Fallon, Nevada is the U.S. Coast Guard Loran-C Station which provides a navigation utility for the Pacific Ocean and the West Coast. Loran-C is part of a world-wide system of navigation mostly used for sea going craft. 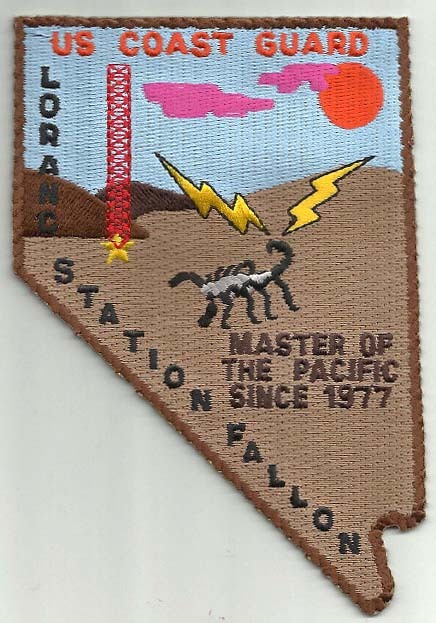 The Fallon station is designated 'M' since it is the Master Control station for the other three West Coast stations designated 'Y' in Searchlight, Nevada, 'X' in Middletown, California and 'G' in George, Washington. 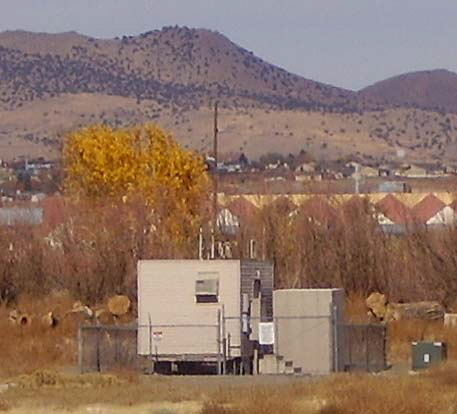 These three stations along with the master station in Fallon allow navigators to determine their position by use of a special Loran C receiver that accurately measures the pulse characteristics of the received signal to determine station ID and then accurately measures the time delay of the precisely timed signal (based on a Cesium atomic clock standard) to determine the receiver's distance from the transmitter. By using the master station signal and at least one slave station signal, the receiver position is determined by timing the two wave fronts to determine their intersection point in reference to the receiver's location. If another slave station can be received then the calculation of intersection point becomes more accurate and likewise the receiver's position. Various corrections are incorporated into the computations to allow for skywave propagation (if any,) terrain (over land or over water) and other minute interferences. 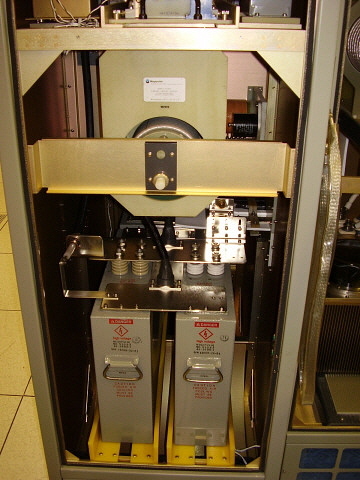 Three HP Cesium atomic clocks keep the accuracy of the system constant since correct timing to the nanosecond is essential for determining true position. The best accuracy of Loran C is about 50 to 150 feet. The transmitter is running 400KW at 100 kHz. The antenna mast is 625 feet tall and 24 top conductors drooping down to large isolators form the enormous capacity hat for the system. The signal consists of a rapid, continuous "tick-tick tick..." centered at 100 kHz. The signal is actually a pulse train made up of eight pulses from each Loran C station. The Master 'M' station has an extra pulse in the train for identification as a "master." Timing is critical as every Loran C station is on 100 kHz and each station has to send its pulses at a precise time for the system to maintain accuracy. The Fallon Loran C is easy to receive anywhere in the west. It is particularly strong in Virginia City as we have "line of sight" to the Loran-C antenna, even though it is nearly 60 miles away. This is because VC is on the east slope of Mt. Davidson at 6200 feet elevation and looking 60 miles east is Fallon at 3980 feet elevation. You can see Mt. Davidson from the Fallon Loran-C Station. 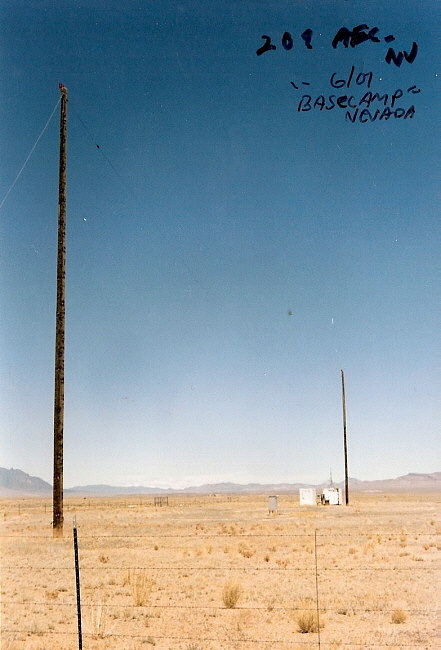 The USGC station and antenna are located West of Fallon at the end of Soda Lake Rd. with a right turn onto Loran Rd. to the site. Below are some photos taken at the station in July 2007. Above: The Control Room with Signal Generators, three Cesium atomic clocks, signal and transmitter monitoring, alarms, communications with slave Loran stations. Everything has a duplicate for redundancy. Above Left: The 625' Antenna base stands on five ceramic insulators. The entire weight of the tower and guy system is supported by these 5" diameter insulators. The feed line is an air spaced coaxial feedline housed in an eight-inch diameter PVC tube that exits from the transmitter building. The box at the end of the feedline is the lightning arrestor. The output of the feedline connects to the tower base with 2" diameter copper pipe. The device to the left of the tower is a coupling transformer for the tower lights - it allows isolation from the AC line if the tower is struck by lightning. The ground connection can be seen at the base of the insulators - four copper sheets 2 ft. wide and .125" thick are buried and also connect to the radial system that is about 900 feet diameter. For a scale to the size of this installation, the sides of the tower are 6 feet across. The circular pads at the top of the triangular section are for fitting spacers to hydraulically jack the entire tower up for maintenance to the base mount. 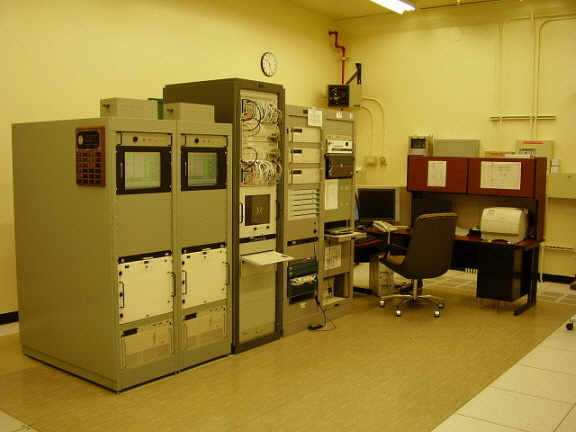 Left: The Loran C 400 KW transmitter built by Megapulse. Most of the transmitter consists of sixteen drivers (eight panels on each side) that shape the final output signal. The station can operate with up to two drivers not working. Past the drivers is the output stage followed by the output coupler. The output coupler attaches to the feedline via two large cables (this 8" PVC feedline exits the transmitter building wall and goes directly to the antenna.) The incredibly large switching load on the transmitter power supplies results in a very loud audible representation of the transmitted signal. 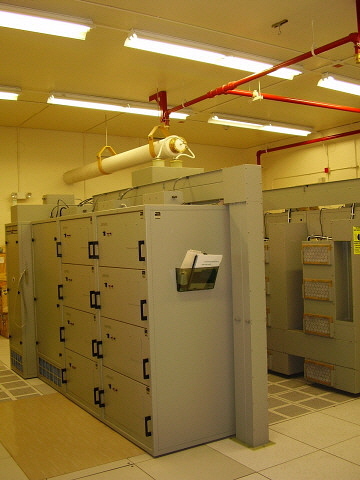 Right: Looking into the rear of the transmitter bay. The red tags remind the technicians that 30,000 volts is present when the transmitter is operating. Also note the yellow sign regarding the noise present around the transmitter. Left: The output coupler stage of the transmitter. One inductor is hand tuned for a "rough" setting while the final tune is accomplished remotely with the motor driven inductor. Below the inductors is the solid state output magnacoupler. Large capacitance can be used with solid state transmitters resulting in smaller inductors. These inductors are about 10" diameter. The coils are wound with a cloth covered multiconductor cable. Note the output cable routed thru the fiberglass wall. This is then routed up to the antenna to feedline coupler that can be seen in the photo above-right. Right: The output tank stage which is adjacent to the output coupler. The tuning inductance is adjusted with a special tool that fits onto the eccentric knob on the shaft. This allows adjustment with the panel installed and the transmitter operational. Below are the massive capacitors that allow the use of smaller inductors. For size reference, the inductor is about 10 inches diameter. NOTE: These photos were taken of the standby units. 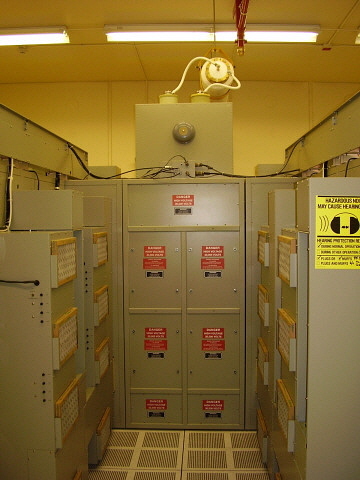 The access doors to the operational units cannot be removed while the transmitter is running without causing a system shutdown. Even removing these standby unit access doors would have triggered an alarm had it not been bypassed in the Control Room prior to opening. Thanks to USCG ET1 Chris Shanks for the tour of the facility. Ah,...the good old days, when there were loads of NBDs everywhere,...even in Nevada. Today (2014,) there are no active NDBs in the state. Here's information and some photos of the last two NDBs in operation in Nevada. Both have gone "off the air" in the past few years - AEC 209kc (OTA 2009) and NO 351kc (OTA 2013.) Additionally, I've added information on some of the older NDBs that were operating here in Nevada in the past. Located on 351 KC is the NDB for Reno-Tahoe International Airport. "NO" runs 25 watts and is a marker beacon physically located at the north end of the airport, in an empty lot, across the street (Mill Street) from the beginning of runway 16R. The antenna is only about 15 feet of vertical radiator with a capacity hat that is about 15 feet off the ground and about 150 feet long. The capacity hat is strung between two "not very tall" telephone poles. The transmitter and climate control equipment are located in and around a small building below the center of the capacity hat. The feed actually enters on the west side of the building through an underground conduit. Coverage is quite good considering the low power of the transmitter and the small antenna. Since "NO" is a marker beacon, it usually isn't listed on any of the NAV-AID sites - but it is operating 24 hrs a day, on 351 KC. About once a year, "NO" is "off the air" for a period of 2-3 weeks. Whether this is due to failures or scheduled maintenance is not known - the signal always seems to return after a few weeks. NO has been off the air for over three months now. This is the longest shutdown yet. Hopefully, NO will return to the air pretty soon. When in Reno last (end of Oct.2013) I drove over to Mill St. to look at the NO site. Everything is still there, the shack, the antenna. Everything appears normal but as of November 7, 2013, NO is still OTA. No change as of July 1, 2014. Consider NO "Off The Air." See updated photo lower right. NOTE: As far as I can tell, "NO" was the last operational NBD in Nevada. photo above: I took this shot of the NO site on September 21, 2015. As can be seen, nothing is left of the NO radio shack, transmitting equipment, antenna or associated structures. The property has been totally cleared. Compare this shot to the shot directly above and it can be seen that the NO shack was located just about center of the view and slightly to the right of the Nugget Towers. I took this shot from the same location behind the auto-repair dealership on Mill St. This pretty much concludes that NO 351kc will not be returning to the air. AEC is on 209 kc and can be received here day or night, indicating that the transmitter might be running power higher than the 25 watts normal for NDBs. AEC is located near Warm Springs, Nevada on Hwy 6 about 60 miles east of Tonopah, Nevada. The site is called Base Camp. The antenna is an "inverted L" configuration with the shack located at one end near the pole support. From aerial photos it appears that there are a number of ground radials running out from a central location between the two poles. At one time AEC transmitted voice weather along with the MCW ID, however nowadays just the CW ID is transmitted. 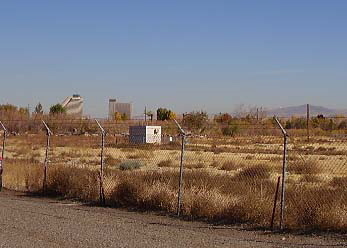 Base Camp is a US government controlled, fenced air field with a maintained runway and some minor support buildings. Though the runway was recently repaved, there are large "X"s painted at each end of the runway to indicate "as viewed from the air" that it is closed and not in use. Apparently no hangers are at the site. What the exact use of Base Camp is remains unknown, although once it was part of the Tonopah Test Range. Though some speculate it now has some connection with Groom Lake/Area 51, this is highly unlikely. AEC is not listed on any of the NAV-AID sites yet it is in operation 24 hours a day, everyday. It is listed on LF websites that show logs of received stations. Consider AEC "OFF THE AIR"
MCY - 326kc - Mercury, Nevada was operated by the US Air Force & the DOE at Desert Rock. Location was north of Las Vegas, near Beatty. Listed on several NAV-AID sites. Latest online information suggests that the NDB is active and is located at the Beatty, NV Airport - info is dated Nov '08. MCY has not been received here and although it is on the same frequency as the powerful Canadian NDB DC, Princeton, BC, it should still be an easy copy. Consider MCY inactive. PYD - 414kc - Groom Lake, Nevada (Area 51) Sometimes listed on NAV-AID sites but has been off the air for several years. SPK - 251kc - Sparks, Nevada has been off the air since the mid-1980s. The location was at the old Reno-Cannon Airport (now Reno-Tahoe Int'l AP.) This station had continuous voice weather with MCW "SPK" ID. From Virginia City, Nevada - 2006 to 2012 - A large percentage of the following NDB stations are ones that I copied from Virginia City, Nevada using only vintage, tube-type receivers. I used several different types of vintage LW receivers. Many NDBs were heard using the 1941 RAZ-1 receiver, but I have also copied quite a few with the 1945 RAK-7 and 1944 RBL-5 receivers. I also logged some "newly heard" NDBs during experiments when testing the 1920 SE-1420, the 1922 RMCA IP-501A and the 1940 Hammarlund SP-200-LX receivers. For the 2009-2010 season, I added the 1945 RBA-6 receiver. My first dedicated LW antenna was a 10' diameter remotely tuned loop but that was destroyed by wind. 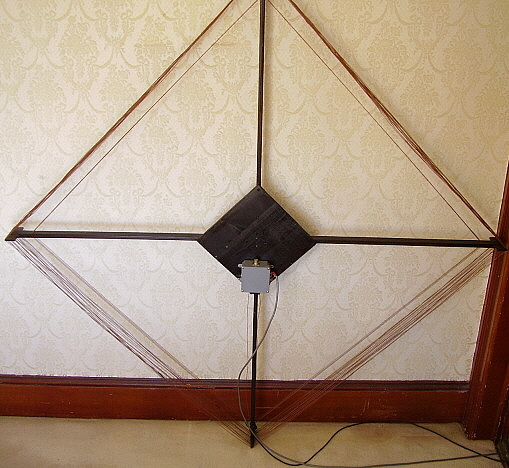 Now, the main LW antenna is a 6' remotely tuned loop located indoors (as of Nov'08.) I also found some new NDBs using various wire antennas. These NDB stations were received during the 2006 to 2012 seasons. Stations are listed alphabetically along with frequency, location and power of the transmitter, if known. Total was 252 NDBs received from Virginia City 2006 up to 2012. 2014-2015 Season - Nov. 2014, started using Hammarlund SP-600VLF-31 receiver. New NDBs heard with the SP-600VLF are in Maroon. Changed to 6' Remote-tuned Loop Nov.15, 2014. Nov 3, 2017 using RBA-1 with 270' CF dipole with 77' of ladder line with the two wires tied together and fed to antenna input. Newly heard with this set-up (6) will be in Orange. Jan 8, 2018 started using Collins R-389/URR with 135' "T" wire antenna. Newly heard with this set up (2) will be in Dark Green.